The Oxen Group is looking for a short sell on Southwest Airlines Co. (LUV) tomorrow. The market may move green or red, and it really comes down to Bank of America, Citigroup, and GE. Those three giants release earnings tomorrow. If all three are splendid, the market will really take off, even Southwest Airlines. The issue for Southwest is that even if that does occur, this stock is going to come down. In after hours today, Moody’s Investor Ratings commented that they were putting LUV on a possible credit downgrade due to the weak demand and market for airfare. The airline industry has been struggling, but Southwest Airlines always seems to be a step in front of the competition. This news of a likely downgrade spells bad news for Southwest, especially because the stock has really no upside right now. What will Southwest do? If the market is looking to trend down after the earnings reports, LUV will drop right away and continue to trend down on a red day. If, however, the market jumps out of the gate and looks bullish, LUV will most likely have some type of small gains into the day, but it will not be able to sustain those gains and move backwards. Further, one has to wonder even if the earnings are positive, how much more this market has to go with four straight days in the green and a lot of quickly overvalued stocks. Additionally, if CIT goes bankrupt it could add more fuel to a downward market. 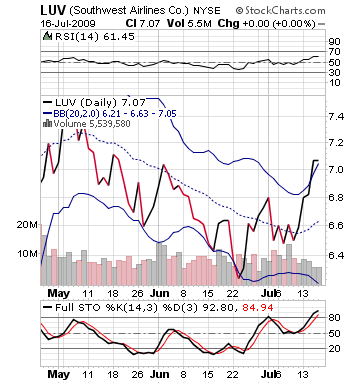 LUV technically is, outside of its upper bollinger band, way overbought. So, its technicals all point towards downward movement. Entry: Recommend selling 15-30 minutes into session if earnings are good, right away if bad. Europe had been trading only modestly higher while Wall Street futures had been pointing to a lower opening. That changed after Meredith Whitney told CNBC Television that she had upgraded her recommendation on U.S. investment bank Goldman Sachs Group Inc. to "buy" and raised her price target to $186 a share — a day before it reports its second-quarter earnings. Whitney, who has been viewed as bearish on the sector, also said Bank of America Corp. could be good value. The Oxen Group is going to recommend the evil stock on Monday, as it seems to have become more and more in the past few years. Goldman Sachs (GS) may be a very solid play on Monday as buyer interest will be rising on the stock going into earnings. 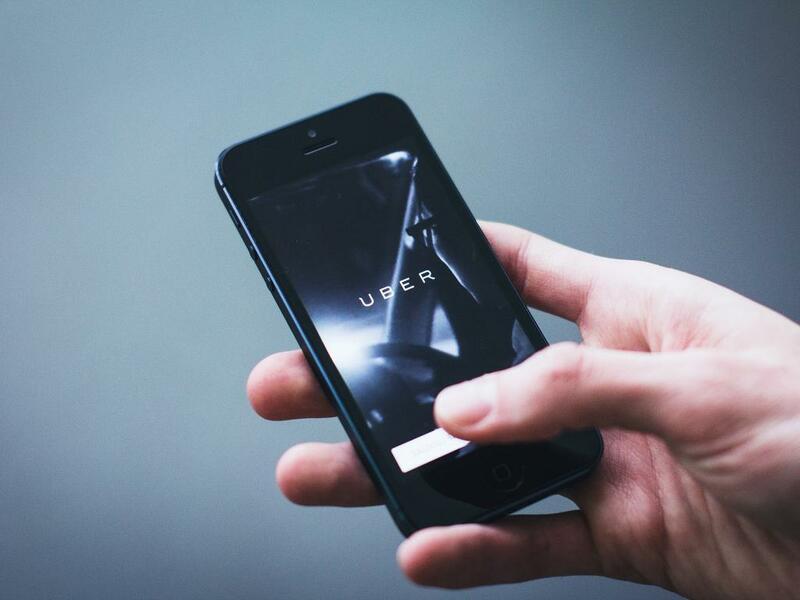 The stock is expected to hit a ridiculous $2 billion profit for the company’s Q2 on Tuesday’s earnings release. The market is looking bearish for tomorrow. Going into the weekend, we got bad consumer sentiment reports, a sell off in the market, and nothing to spark our interest over the weekend. Until we see a multitude of companies giving investors reason to buy, the market will continue to be sideways to slightly bearish. Monday morning, the only company reporting earnings of any concern is Fastenal (FAS), and it does not have the capabilites to move a market. The Oxen Group is trying out another new style of investing tomorrow. In this market, finding a single day trade you can count on pretty difficult. Tomorrow, however, we are fairly confident the market should have a solid increase. Alcoa earnings came out kicking for the beginning of Q2 earnings, and the market has responded with some of the first green futures we have seen in quite some time. With bargains in the market, Alcoa looking great, a positive report from the Fed about consumer credit, and the possibility of positive earnings from a number of tech companies,I would say this Thursday is looking as good as the market can look. 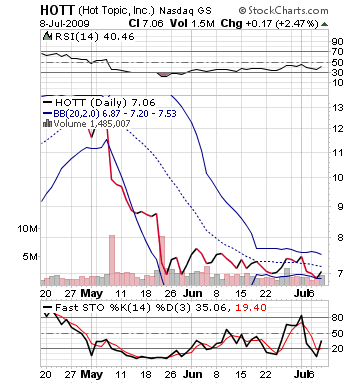 Therefore, Hot Topic Inc. (HOTT) may be a very nice play for some large movement. The company actually had very negative after hours news, lowering their Q2 earnings outlook and lowering their revenue estimates. The company will definitely take a stumble tomorrow morning on the news, with a 6% decline in after hours. However, if the market really does make a move up tomorrow, Hot Topic may be in a position where it can significantly move up from valley. 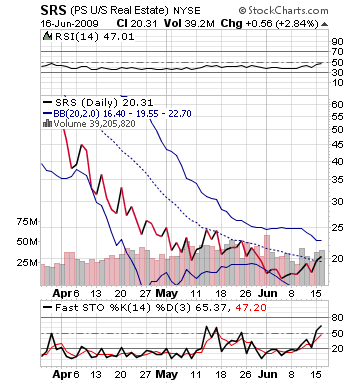 The stock is very near a lower bollinger band, it is oversold, and it really has little room for downward momentum. The Oxen Group is confident the stock should bounce off a bottom and move upwards from there. How low it goes is the challenge, but we think a 2 to even 3 percent move downwards should be a nice play to buy in. The stock is not a great long term play, but it is a nice play off a bottom tomorrow. Entry: Recommend buying in around 2-3% decline from opening price or 20-45 minutes in. David at The Oxen Group recommends a purchase of Direxion’s Oil and Energy Daily Bull ETF (ERX) for Tuesday. The oil market may be ready to make some positive gains which should light a fire under this ETF. Oil is looking slightly bullish on Tuesday to begin with because of a technical correction that is needed. The market has fallen over 10% in a week, and prices have moved down too low, too fast. A lot of sellers have sold and are becoming buyers again. Gerard Rigby of Fuel First Consulting believes oil is ready to move back to $70 per barrel as the economy is in the same place and there really is no reason for it to move down any further. He believes the profit taking and correction is done. At least for tomorrow, this makes sense. Tomorrow, there is really no significant economic news once again and no primary earnings, which should send the market into a similar seesaw that it was in today. This is a perfect opportunity for a purely technical correction. More bad news from Nigeria’s militant operations, analysts’ saying crude inventories are falling again, and speculation on the EIA data on Wednesday could all be catalysts to help drive up crude prices slightly. The price of oil gained in Asia, which is a telling sign that a technical correction should be on the way. The futures are slightly negative, but with no positive news in the after hours, this seems logical. 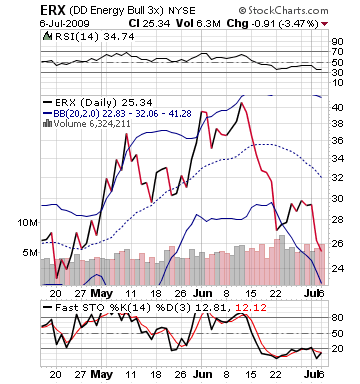 ERX will benefit greatly from any movement positively in oil prices. The stock has dropped over 10% in just two trading days, and it looks poised for a pop. Get in early and ride a nice 3-4% gain. Entry: Recommend entering 10-25 minutes into session. Exit: Recommend exiting on 2-4% increase from buy price. 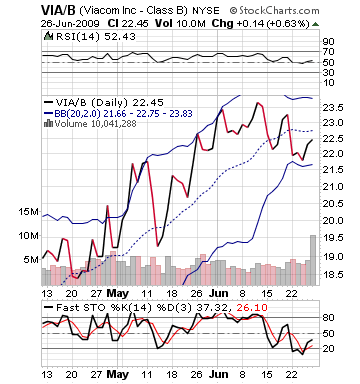 On Monday, to start the week, Viacom Inc.’s Class B (VIA-B) stock looks ready for a nice move. The stock should benefit from some fundamental and technical analysis. 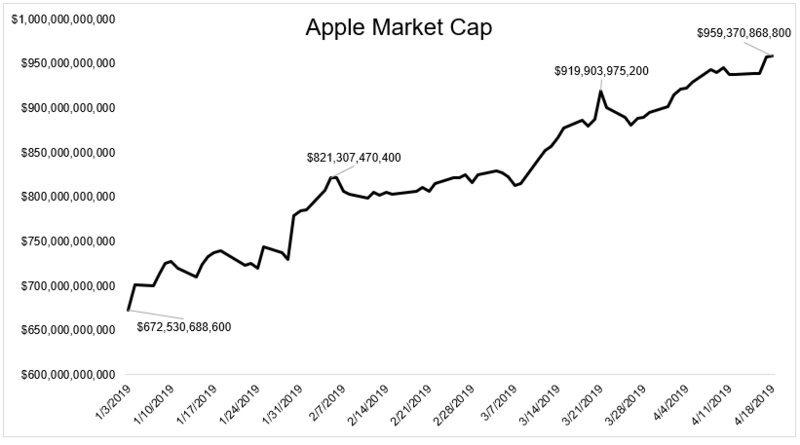 The market is in a sideways trend, currently, waiting for the Q2 earnings to be released to see where the market is at, and the market is no longer able to move on just about anything. Therefore, fundamental news will really make it for this market. Viacom will benefit from the bullish news coming out from "Transformers: Revenge of the Fallen." The movie has been a box office smash, which was released by Paramount Pictures, a subsidiary of Viacom Inc. Transformers made $112 million this past weekend, winning the box office, becoming the top grossing movie thus far this year in the first weekend. Most analysts and studios were not expecting as outstanding results, and the movie is falling just short of "Dark Knight" last year. In just five days, Transformers II did 2/3 the total earnings of Transformers I, and it performed well besides weak reviews. The next closest movie, "The Proposal," only accrued $18.5 million. Technically, this news should send a shot into Viacom. 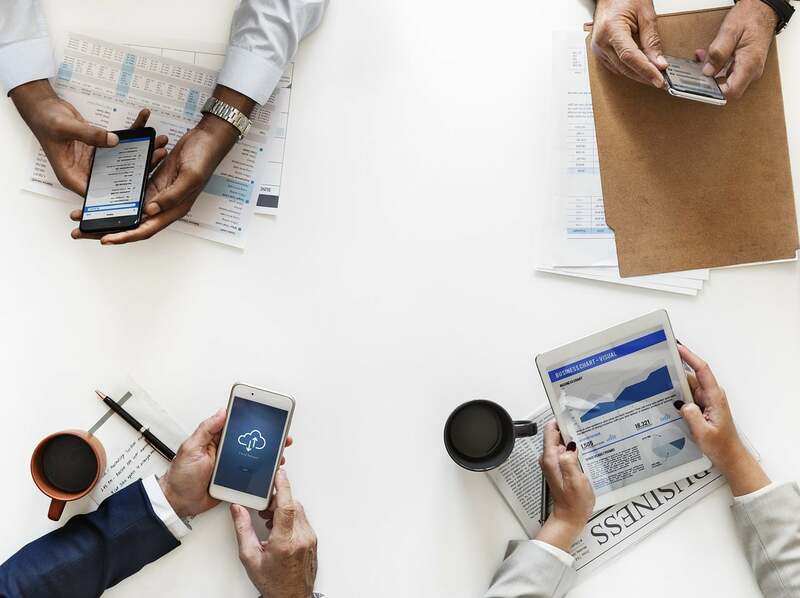 The stock has been oversold, near its lower bollinger band, and it has been trending up on fast stochastics, meaning there are a lot of potential buyers ready to enter the stock. Monday’s market is not looking bullish or bearish, with little fundamental news on the horizon and nothing too important as far as earnings. Asia is mirroring an expected sideways market that should play out in the USA. The last bit of positive news would be that this is the July 4th week, and this week tends to be bullish. Wait for a pullback on VIA. 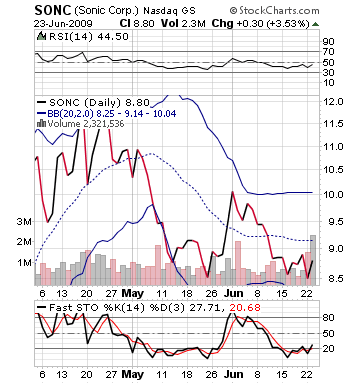 Tomorrow [now today], Sonic Corp. (SONC) looks to be a very bullish for tomorrow. In after hours, Sonic reported very positive earnings, beating expectations on revenue and EPS. The reason we like Sonic is because the company should be able to move up significantly. First, the market looks pretty positive for tomorrow. The Fed’s expected announcements should be extremely positive for the market as they should confirm rates and give bullish news on the economy. Futures are already up strongly for the Dow and S&P as they expect good news from the Fed. Even if the Fed news is not extremely bullish, the market should move SONC up higher before the announcement, which should come sometime in the early afternoon. Sonic’s earnings beat EPS by 0.04, even though the company did see a dip in profits and sales. However, the company was highly criticized for their pricing in the last quarter and introduced a cheaper menu to draw in customers. Typically, when a company reports strong earnings, The Oxen Group does not like to recommend it because the stock will move down from a gap up. However, with Sonic, the stock has a low volume, which means that the stock should be flooded with more investors, making it easier for the rise. Further, Sonic has strong technical indicators that should also help the stock move up. 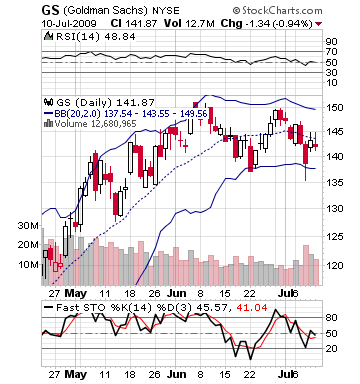 It is slightly oversold, undervalued, and towards its lower bollinger band – it has a lot to room move up. After the stock gaps up, and moves down, with a bullish market, Sonic earnings should continue to advance the stock. The Oxen Group, for Wednesday, is looking at a continued bearish market for a third straight day. With today’s bullish economic data, investors still sold off stocks, pointing to a bear market that should continue as a bland day continues tomorrow. Most analysts think that Obama’s financial regulation plans will not do much for the market. Futures are up, in after hours, but with this data, if a rally cannot be held, then there is no reason to expect a positive day at this time. The CPI will determine the day. One industry that really looks bearish tomorrow is housing. The housing industry got a shot with, on the surface, bullish news. Instead, the housing market ended up with minimal gains or in the red. Light volume shows that investors are not excited about the market. Tomorrow should continue a downward trend for housing sparked by a downgrade of Beazer Homes to ultra-junk status by the S&P. That sent the stock down 10% in after hours. This is really a market that needs some very bullish jolt to get it going, and it until that happens this market is fundamentally bearish. With that said, Ultrashort Proshares Real Estate looks to be a strong play as an inverse to the housing industry, which should fall after its run up today. Technically, the ETF has been moving and is trending upwards with more buyers getting involved. Buyers are still on the sidelines to short housing. Buy in early and watch the run! Entry: Recommend buying within first 5 – 25 minutes.